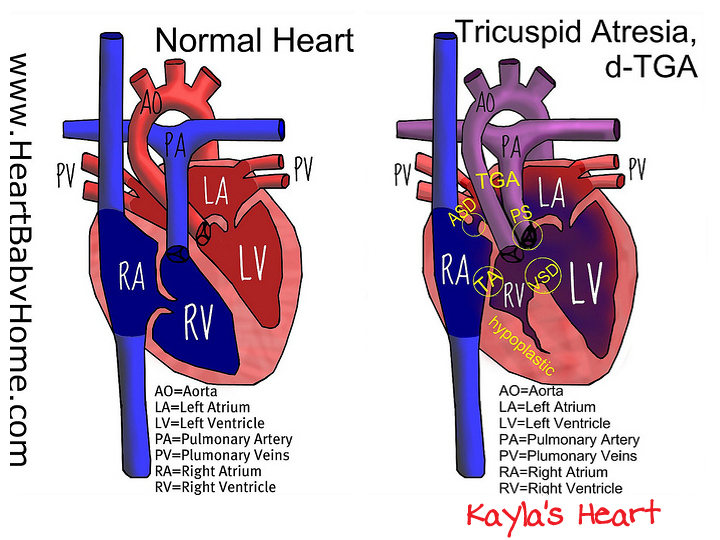 Thanks to Nanette at www.HeartBabyHome.com for drawing this picture of Kayla's heart! Atrial Septal Defect (ASD) [septum=wall between the chambers of the heart, atriums=top chambers of the heart] – holes in the inner walls of the heart allowing extra blood flow between the two upper chambers of the heart (atriums). Double Outlet Left Ventricle (DOLV) [outlet=passage for exit, ventricles=lower chambers of the heart] – both vessels (aorta & pulmonary artery) carrying blood away from the heart come out of the left ventricle. (Normally the aorta carries oxygen-rich blood from the left ventricle and the pulmonary artery carries oxygen-poor blood from the right ventricle). Hypoplastic Right Ventricle (HRV) [hypo=under, plasia=formation or development, ventricles=lower chambers of the heart] The right ventricle is under developed. It is too small. This means the heart will have to work harder and won’t last as long. Sometimes the valves entering or leaving the right ventricle are also too small or missing. mild Pulmonary Stenosis [pulmonary=having to do with the lungs, stenosis=narrowing of a passage, ] – a narrowing of the pulmonary artery (which carries blood from the heart to the lungs) at or near the pulmonary valve. Transposition of the Great Arteries (TGA) [transposition=switch the order, great arteries=the aorta & the pulmonary artery] – the positions of the great vessels are switched so that the aorta (which carries oxygen-rich blood to the body) is closer to the oxygen-poor blood AND the pulmonary artery (which carries oxygen-poor blood to the lungs) is closer to the oxygen-rich blood. It is usually accompanied by a hole in the wall between the ventricles (ventricular septal defect or VSD). 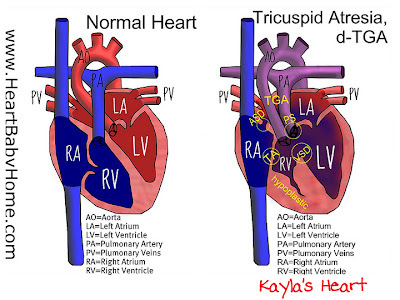 Tricuspid Artesia (TA) [atresia=absence of a normal opening] the valve that controls blood flow between the right atrium and the right ventricle in the heart is missing or fused shut. Ventricular Septal Defect (VSD) [septum=wall between the chambers of the heart, ventricles=lower chambers of the heart] – holes in the inner walls of the heart allowing extra blood flow between the two lower chambers of the heart (ventricles). This causes the oxygen-rich and oxygen-poor blood to mix before leaving the heart.